That's a wrap (oh and more free stuff) - Stop staring and start sewing! I really love the Farbenmix patterns. They're from Germany and they are really a lot of fun because they are simple and spunky. The part I'm not crazy about is tracing the pattern. All the sizes and pieces are on one big page and you really have to pay attention since everything overlaps the other pieces. Some gals draw over the lines using a different color for each size which is a smashing idea (I just haven't done it yet, but I do have good intentions). Another things that's unusual (compared to the typical pattern) is that you have to add your own seam allowances which is not difficult to do, it's just easy to forget. Anyway, go to the website and check out all the finished examples people sent in (you have to click on "Galerie" which I'm guessing is German for "Gallery", just a guess though). Those crafty Europeans get really creative with the colors and patterns and it's so much fun. This is my favorite pattern, the Anna wrap dress. It's fast, easy, fun and most of all extremely cute. Once you figure it out, you can put one together in about an hour! And yes, I mean "you" regardless of you level of sewing experience. Really. Try it and let me know, I could be wrong (but I seriously think I'm right on this one!). I put together a few this week. I made three in one afternoon just sitting here in my sewing room with my girls. This ones really fun and crazy and makes me happy. 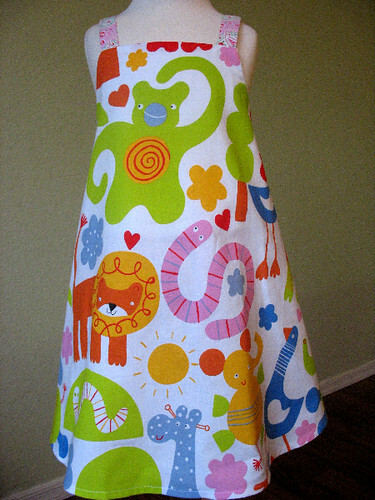 If I were a little girl I would wear this to the zoo and everyone would oooh and aaah at me. 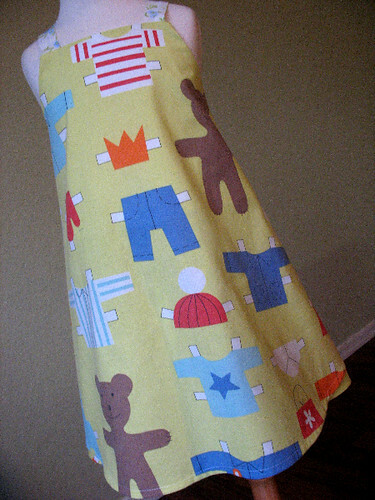 I really adore this bear paper doll fabric. 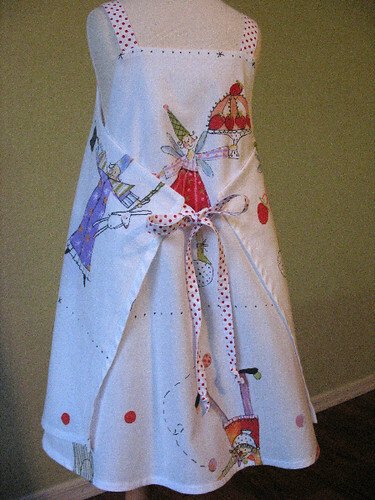 Again, if I were a little girl I would have to wear this while playing with my paper dolls (which was my favorite "my sisters won't play with me so I have to play alone" pastime when I was little). This fabric is for wearing to Cirque de Soleil I'm sure (back view of the dress). 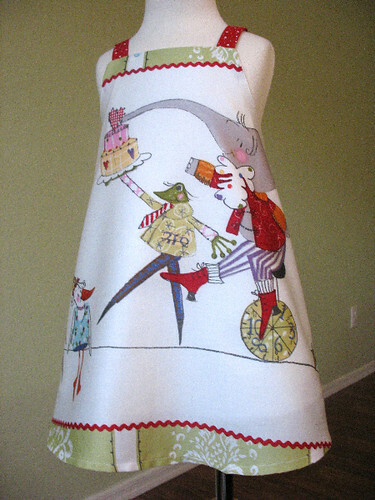 And this is my current favorite which would be the perfect birthday dress! If you want to check out my ebay listings, I'm continuing my quest for that new machine (I think I shall call her my sweet Elna) and these dresses are among the things I have listed. Oh and did I mention YOU GET A FREE SET OF HEATHER BAILEY'S TRASH TIES WHEN YOU WIN THE AUCTION???!!! 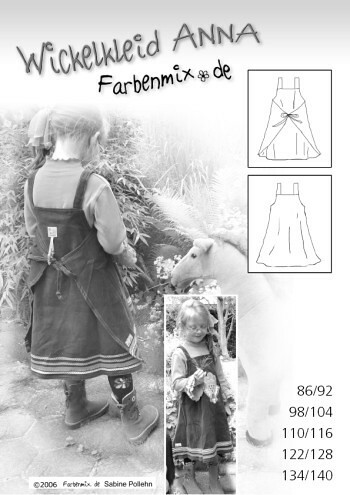 AND......With every bid (no matter how teeny tiny small and seemingly insignificant) you get entered into my drawing for a free 4 piece twirl skirt set made from the Fabulous Freshcut Fabrics???? Well, it's true. Oops! I failed to mention that you CAN get these patterns here in the US! Farbenmix has a link to English sites (click on the British flag) and you can also look at this terrific site: Banberryplace.com. They are not expensive either!